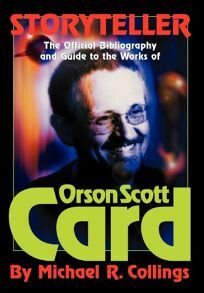 Following a more academic format than the above is Storyteller: The Official Orson Scott Card Bibliography and Guide, by Michael R. Collings. Collings likewise supplies commentary on the individual works of the bestselling author of Ender's Game (1985) and other SF and fantasy classics, along with lists of secondary sources. Illustrations of each of Card's dust jacket covers add visual appeal.